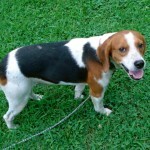 Hi, I am little guy they call Rusty, I am a Beagle/hound mix and am 2years old. 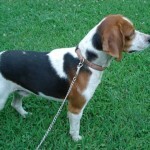 I am up to date on shot’s neutered, get along with other dogs and am a real lover, I like to cuddle. I was taken from a kill shelter down south nobody knows anything about my family. I was ill when I was rescued but have put on weight and am better now. I would like a family of my own other dogs are ok as long as I get lots of cuddle time.